This model uses no heat, and efficiently fills the room with the aroma and therapeutic properties of essential oils. This beautiful and sleek unit is made of wood and glass. 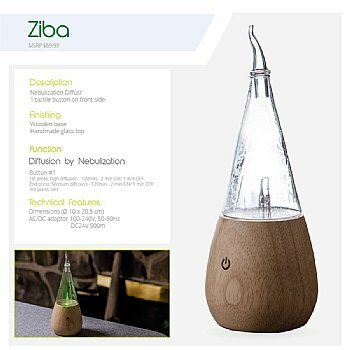 This is a nebulizing diffuser and does not require water. 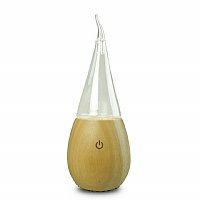 Simply add a few drops of pure essential oil to the unit and turn it on. The Ziba has a high speed and a low speed and seven color changing lights. It's virtually silent operation and ease of use make it perfect for any environment. Recommended for spaces of 500 square feet or less. Note: Unit runs for two minutes on, one minute off. After two hours of continuous operation, the unit will shut itself down. Measures 10 x 20.5 cm. Review: it's really pretty and works great so far!